Farm Girl Pink....: ~ Vintage recipe - Kraft Marshmallow Broiled Icing... in Pyrex! 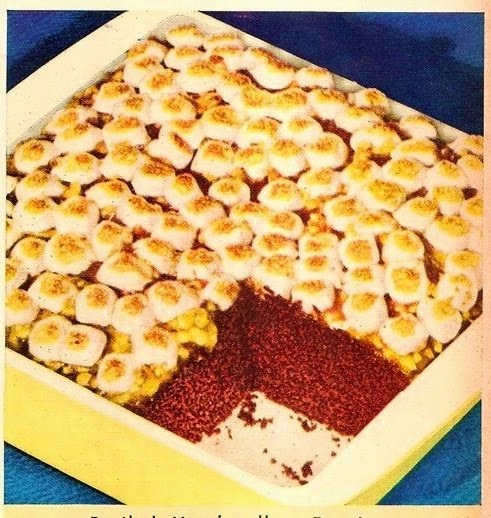 ~ Vintage recipe - Kraft Marshmallow Broiled Icing... in Pyrex! Well lookie there! My favorite 9x9 Pyrex brownie making pan! It is even in that fabulous unique yellow color. 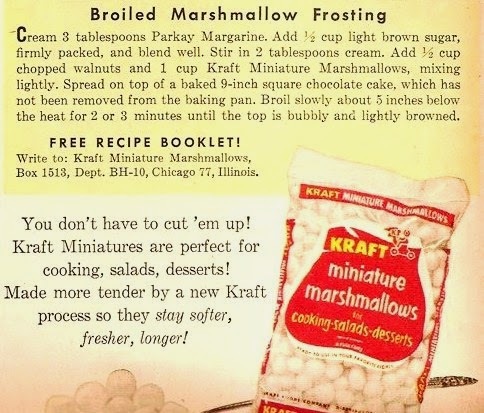 So today this is a vintage recipe for Marshmallow icing. It is a really simple quick way to top off any chocolate cake or brownies. With a little Parkay margarine, brown sugar, nuts, milk and a cup of Kraft Marshmallows. You can have a great gooey, yet with a hint of crispy... icing for you cake! What a great idea! And a cute recipe with the Pyrex!